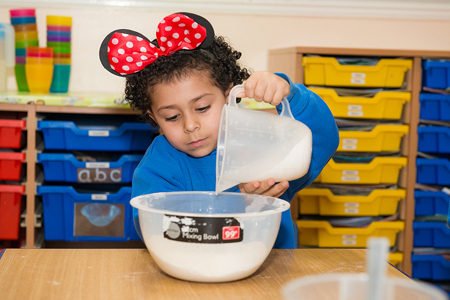 Here at Chrysalis we are fully committed to a healthy eating programme, delivering quality food to all our children. All meals are included in the fees and are specially prepared each day on the premises by our on-site chef using the highest quality fresh ingredients. Children are provided with three meals plus a mid-morning and mid-afternoon snack and have water available throughout the day. We cater for all dietary needs. Both our Under 3s and Pre-School site were awarded the top 5* Food & Hygiene rating by Environmental Health at the most recent inspection in September 2017. Breakfast consists of non-sugared cereals and wholemeal toast. Snacks consist of various fresh fruit, crudités, breadsticks, crackers and oatcakes. Lunch is always a balanced hot meal, cooked by our on-site chefs using fresh ingredients. Tea is always fresh and includes various choices including sandwiches, homemade soups, and crudités alongside a variety of fruit.